Today we’re excited to share with you a brand-new website, brought to you by the Odyssey Scoop. 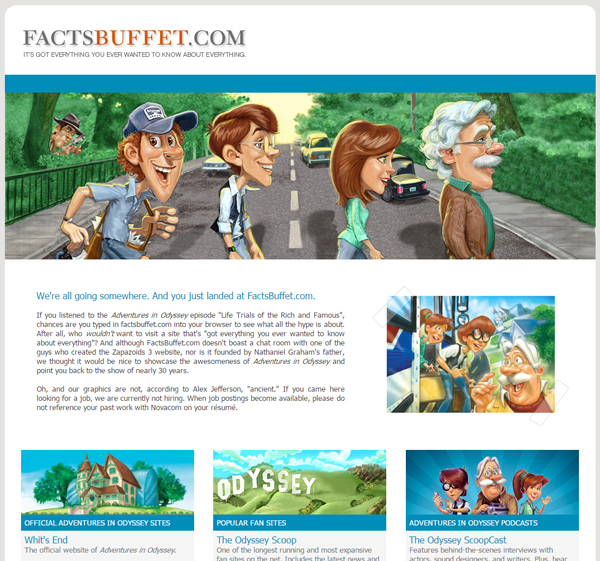 Introducing the all-new FactsBuffet.com! FactsBuffet.com is briefly mentioned in the episode Life Trials of the Rich and Famous, so we thought it would be fun to create a site that points back to all the online websites that make being an Adventures in Odyssey fan so exciting. For now it will serve as a portal to official Focus on the Family links, popular fan sites, and message boards. In addition, we will be promoting latest AIO releases as they become available.